An American man was partially paralyzed after a mock bullfight following the first running of the bulls Friday in Pamplona, and seven other people were hospitalized after being gored or trampled by the massive beasts. Danger is what draws throngs of revelers to Spain's most famous festival each year, and danger is what they got in the narrow streets of this ancient Spanish city. Ray Ducharme, a 31-year-old bond trader for Bank of America in Charlotte, N.C., was injured in what is known as a vaquilla, in which hundreds of people chase five cows around the bull ring, pulling their ears and tail. The cows are smaller than fighting bulls and have less imposing horns, but they still weigh hundreds of pounds and can be threatening. Ducharme, a Bath, N.Y.-native, was thrown by a young cow in the event and underwent a 90-minute operation at the Hospital de Navarra to reattach two vertebrae. "He is paralyzed in the legs, and will have partial use of his arms," said Pello Pellejero, a Pamplona government spokesman. "He is in very serious condition." Ducharme's father, Ray, described him as an avid soccer player and said his family hoped his high level of physical fitness would help his recovery. Seven injuries were reported during the run itself, at least two of them serious: New Zealander David MacDowell, 25, was gored in the thigh, and a Pamplona native, Ramon Garayoa, 46, fell and was trampled. The bull run began at 8 a.m. when six bulls, each weighing about 1,500 pounds, stormed out of a corral where they spent the night, then zoomed up packed Cuesta Santo Domingo street at the start of the 900-yard run. They were accompanied by six castrated steers who know the route and are meant to keep the bulls in a single pack. Thousands of runners, most wearing traditional white shirts and pants and sporting red handkerchiefs, dashed in front of them. Each pack ran with the bulls for a short distance before darting out of harm's way. The rampage ends in minutes. 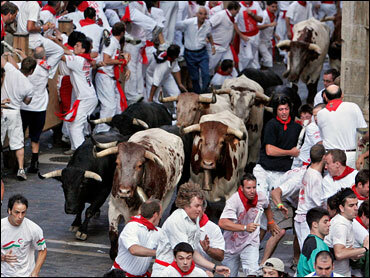 The bulls rush into the Plaza de Toros, where some of Spain's better-known bullfighters awaited them in the afternoon. The festival lasts nine days. Before Ducharme's injuries became known, runners said their brush with death was everything they had hoped for. "It was total emotion. It was absolutely crazy. The bull was right next to me and I touched him," said Norman Rilling, 25, from Bakersfield, Calif.
Bulls are surprisingly fast animals, and many of the runners had been up all night drinking. Police are instructed not to let anybody who looks too inebriated take part in an effort to cut down on injuries. That is easier said than done, and many participants had clearly had long nights. Julio Bernavides Alvaran, 65, who came to the festival from Valencia in southeastern Spain, said he wandered the streets for hours looking for a place to sleep before deciding to use his credit card to get into an empty bank machine cubicle. Still, he only had a couple of hours of rest before the run, which he described as the thrill of a lifetime. "Life disappears, and you feel your blood moving in your veins," he said. "Either that, or it's all the whiskey." The San Fermin festival dates back to the late 16th century, but it was Ernest Hemingway's 1926 novel "The Sun Also Rises" that made it famous. A bronze bust of the writer stands outside the bullring where the runs end. Since record-keeping began in 1924, 13 people have been killed during the runs. The last death was in 1995.